A spectacular barn with space for all. Ideal for a family get together or celebration. Known for its beautiful countryside and historic houses the county of Buckinghamshire has a wealth of things to see and do. A Georgian house with its own outdoor pool, traditional furnishings and a wisteria-clad entrance. This detached property is just outside Withyham near Hartfield and sleeps twenty people in seven bedrooms. 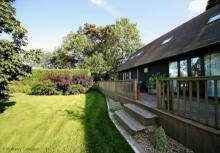 Exclusive high quality holiday cottage complex set high in the tranquil South Downs National Park for groups of 20.